Forget about the wine – local microbreweries are turning out some fabulous flavored beers perfect for seasonal sipping and pairing with special holiday meals. 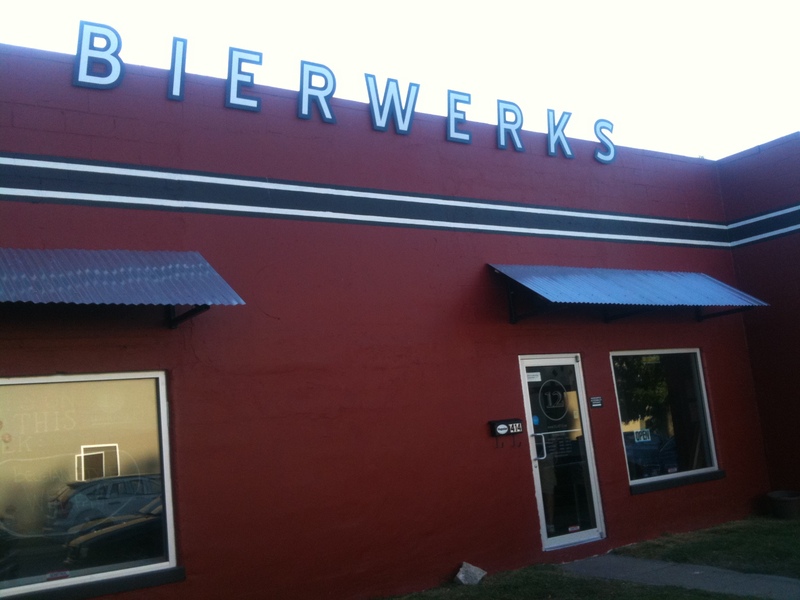 Bier Brewery – Brewmaster Darren Conner is cranking through a whole bunch of enticing seasonal quaffs including a pumpkin ale — or as Darren calls it, “liquid pumpkin pie” — brewing now through December; a chocolate stout; and a winter porter spiced with star anise, juniper berries and sweet orange. Check out his web site for availability and get ‘em while you can. This nanobrewery only concocts small batches and when they run out, so does your luck. Triton Brewing Company – Seek out the new Gingerbread Brown, redolent with all the spice of this classic holiday treat and tapping this Wednesday just in time for Thanksgiving. Also noteworthy, Mike DeWeese says Triton’s Magnificent Amber and Deadeye Stout are both aged in bourbon barrels and spiced with the season-appropriate flavors of cinnamon and nutmeg. Sun King Brewing Company — Dave Colt and Clay Robinson are cooking up Malus Pi, a tart and tangy wheat beer infused with crabapple juice. Late frost is making it difficult to pin down a definite release date, but the beer should be out sometime during the holiday season. Das Bier Big Dawg Brew Haus — Richmond’s newest brewing operation has plans for a delicious-sounding dark chocolate peppermint stout to release on or around December 10. With beer this scrumptious, who needs dessert? Upland Brewing Company — This SoBro tasting room is pouring some interesting brews, including Winter Warmer barleywine, a dark and malty English quaff perfect for chasing the chill out of cold snowy nights. Upland has also aged a little bit of last year’s Winter Warmer in three-year-old barrels from Kentucky’s Buffalo Trace Distillery to re-release as Bourbon Barrel Warmer. There’s also Teddy Bear Kisses to consider, a soon-to-be-released velvety Imperial Russian stout with roasty bittersweet chocolate notes. I’m sure there are plenty more local seasonal beers out there worthy of a holiday dinner. Feel free to add a comment with additional suggestions. This Thanksgiving, I’m toasting to you, fair readers! I realize it seems I’m writing about nothing but beer lately, but hey, that’s what’s going on here in Indianapolis at the moment! Our fair city seems to be in the midst of a microbrewery boom, so I figure it’s only prudent for me as a freelance food writer to keep on top of the trends, n’est pas? Last night, hubby and I checked out the brand spanking new Triton Brewing Company on the grounds of Fort Benjamin Harrison, a former military post on the northeast side of town. Named for the Greek god of water and housed in a renovated circa-1920s mule barn, Triton’s got it going on when it comes to curb appeal. Although technically it makes its home in an old barn, the inside is uber modern, sophisticated and sparkling clean with high beamed ceilings, dark wood and shiny brewing apparatus visible through the windows into the room where all the magic happens. This is perhaps the nicest tasting room I’ve seen in town, and easily passes as a full-fledged bar. One small complaint, though — with a few televisions mounted around the room, a decent crowd of people and fairly loud music playing, it’s a little on the noisy side in here. Triton doesn’t do the traditional beer tastings I’ve seen elsewhere where you stand in line at pouring counters to get a little swig in a plastic cup. Here, you get actual table service. If you want a taste of something, they’ll bring it to you in a small honest-to-God glass tumbler. This process takes a little longer, of course, but that’s ok. This snazzy microbrewery has only been open for a couple of weeks, so there were only three Triton beers available for tasting last night. Inventory will increase as time goes on, of course. In the meantime, the menu also offers a handful of guest taps to round out the mix, as well as samples from New Day Meadery in Fountain Square. 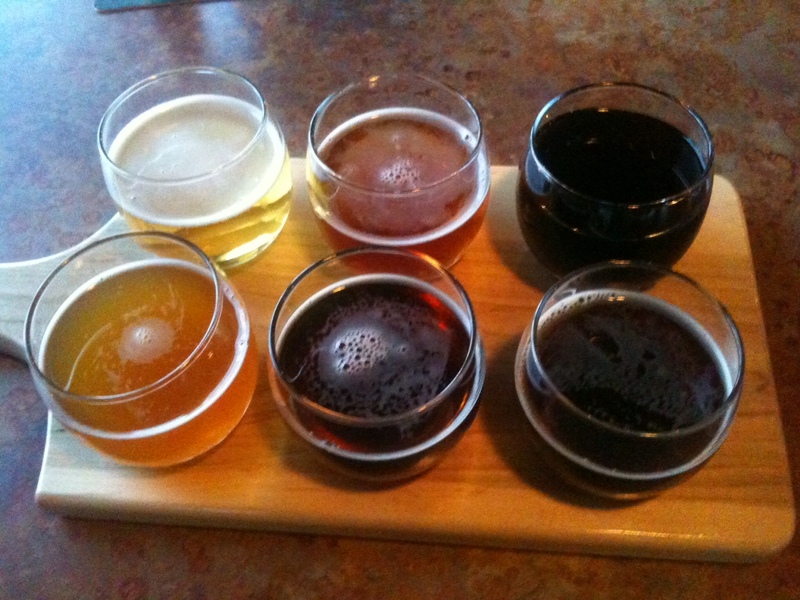 You can get pints of anything on the menu for $5 – $6 a pop, but we decided to do a beer flight – six 5-oz. pours of the various brews for $9. The flights are served in those same glass tumblers on slotted wooden cutting boards. Top marks for presentation. Of the Triton beers we sampled, I enjoyed the mellow, toasty, caramel-y Four Barrel Brown the best, with the Fieldhouse Wheat coming in a close second. Through trial and error over the past year or so, I’ve come to the conclusion that I’m not really an amber fan, nor do I care much for IPAs. Browns, wheats and the occasional stouts are much more my speed. In addition to the three Triton offerings, we filled out our flight with pours of Rivertown Helles Lager from Cincinnati and Oktoberfest from Sun King — both light, refreshing and highly drinkable. The Triton root beer was the only sample of the six that we didn’t really care for. The flavor was a little bland and it wasn’t fizzy at all. More carbonation definitely would have helped. Although Triton isn’t personally cooking up the vittles, there are a couple food options available including Taste of Philly soft pretzels (if this isn’t a match made in heaven, I don’t know what is). Hoosier Fat Daddy food truck was parked right outside the front door and open for business during our visit; visitors can order up and bring their food indoors to enjoy along with their beverage of choice. All in all, we were impressed with Triton. 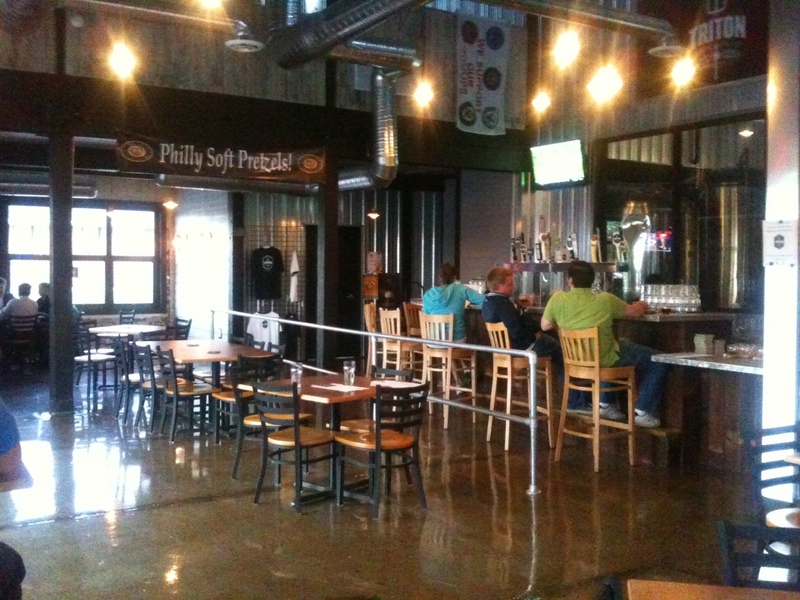 Very nice facility in an unusual historic setting, good local beers, interesting food options. What’s not to like? 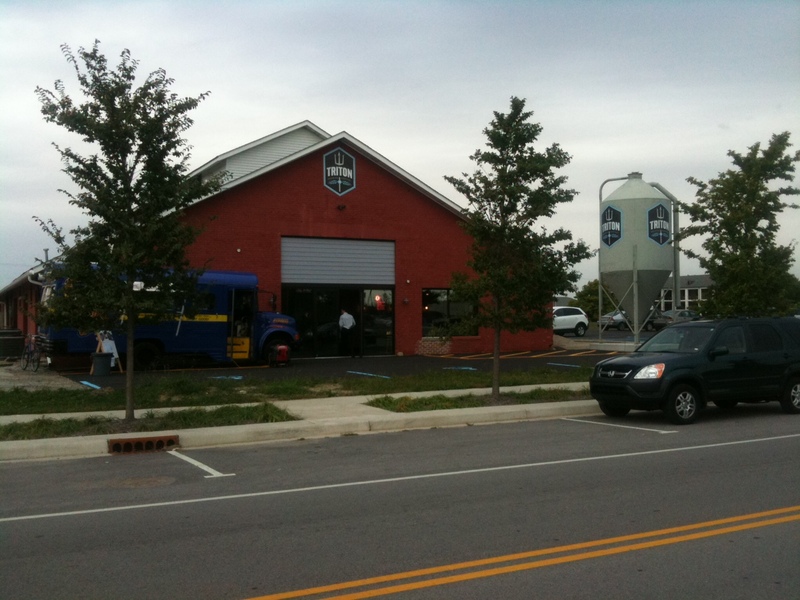 Triton even offers tours of the brewery for a behind-the-scenes look at the whole process. Sweet. A friend brought Twenty Tap to my attention last week in a mass email when she announced she’s now hostessing there one night a week and we should all stop by and check it out. I was happy to get the chance to do so. 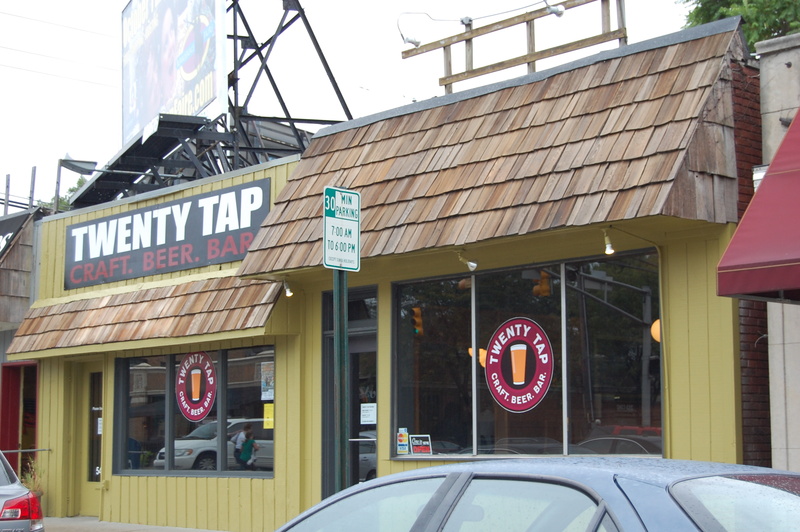 Twenty Tap is the brainchild of Kevin Matalucci, of Broad Ripple Brewpub brewing fame, nesting down in the former home of Northside News at 54th and College. The guy has obviously put a lot of effort into putting a new face on the business via tall wood booths, spherical hanging light fixtures and walls dressed in earthy hues. A girlfriend and I stopped in for dinner last night. 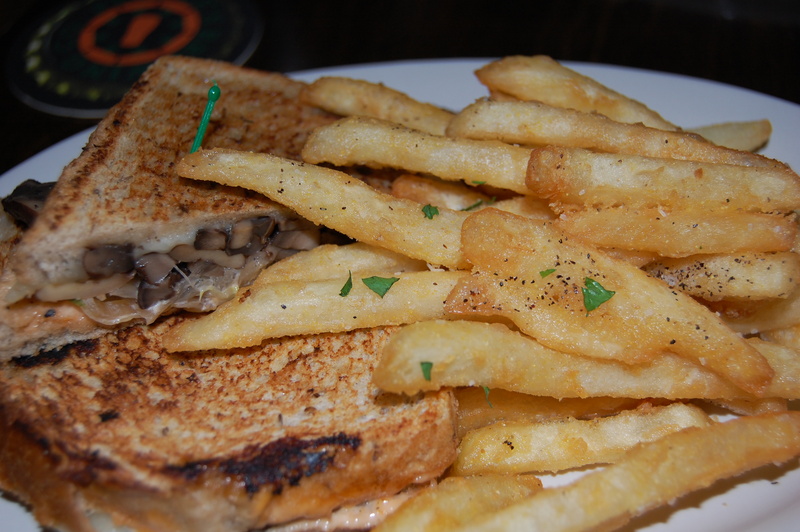 My first impression was that Twenty Tap has a bit of a split personality— half restaurant and half pub. To the left is an open bar area with electronic darts; to the right, a family-friendly dining room. Everything looks fresh and clean, but I couldn’t help but think the place feels somehow unfinished. Perhaps some more art on the walls would help. Maybe, like a new apartment, it just needs a little time to develop a more lived-in feel. The dining room was fairly empty when we arrived just after 6 p.m., but steadily filled to capacity during the course of our stay. In a nod to terroir, Twenty Tap distinguishes itself by serving 20 craft beers, all made within Indiana (like Tomlinson Tap Room). Always nice to see locavoracity in action. 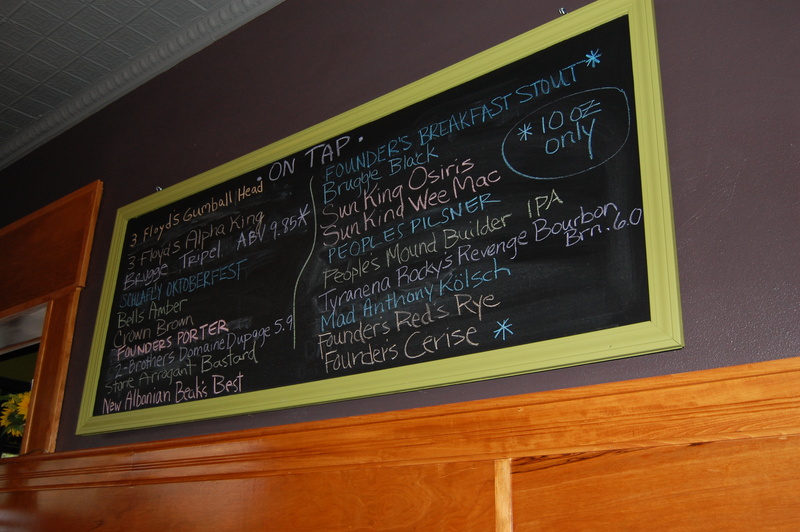 Beer choices are listed on a blackboard wall (this trend seems to be everywhere these days). I settled on a pint of Fort Wayne-based Mad Anthony kolsch, and my friend (a non-beer drinker) seemed happy with her Sun King Wee Mac. Our young server seemed pretty up to speed when we asked him for recommendations. The menu details gastropub-ish grub, with a few surprises. From what I keep hearing, the pressed Cuban sandwich (a tribute to the version formerly served at Northside News, I assume) is the thing to order, but I passed it up to try the mushroom Reuben instead. Saying she wasn’t all that hungry, my friend asked for the pimento mac and cheese, a $5 appetizer offering with optional bacon for an extra buck fifty. There’s also a handful of burgers, a few salads and a soup du jour. Three-bean salad sounded like an interesting side alternative to standard fries. We settled in to enjoy our beers and everything was going fine until our server apparently fell off the face of the earth. People sitting next to us (who’d ordered long after we did) received their food, and my pint glass sat empty for long enough that we started to wonder where the heck our guy had disappeared to. Finally, our dinners arrived (reassuringly hot, thank goodness) and I was able to get a refill on my kolsch, so all’s well that ends well. 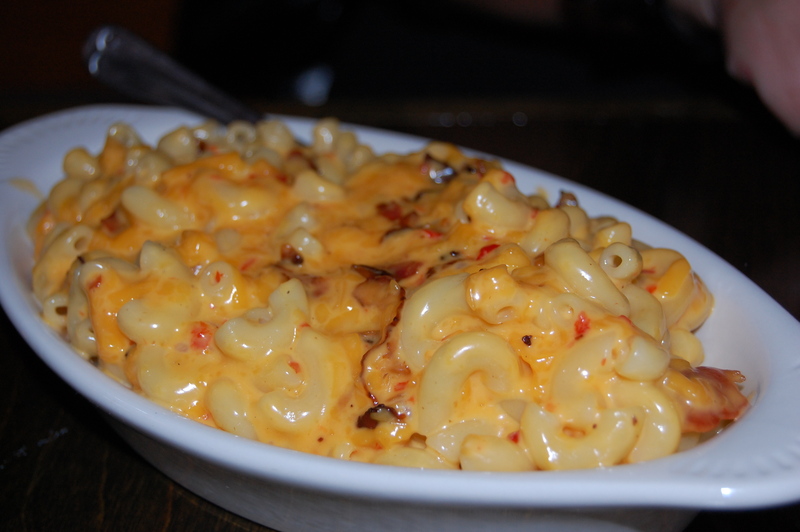 The macaroni was nicely cooked to al dente and the sauce had a subtly spicy pimento tang. My sandwich was ok, subbing strips of sliced mushroom for corned beef with all the other traditional Reuben accoutrement, but I must admit, I found myself wishing I’d gone with the word of mouth buzz and ordered the Cuban instead. The fries were crispy and lightly dusted with black pepper. Halfway through my meal, the server dropped off a tiny ramekin of house-made pickles. The cucumbers were sliced paper thin and the pickling liquid had a flavor note I couldn’t quite put my finger on. Cinnamon, perhaps? Last night, hubby and I headed downtown to sample the wares at one of the more recent additions to the thriving Indianapolis microbrewing scene — Flat 12 Bierwerks. We’re well familiar with Sun King and Thr3e Wise Men has become one of our regular Broad Ripple hangouts, but I must admit, I didn’t know a great deal about Flat 12 going in. Hubby’s enjoyed the beers on several occasions at pubs around town, but this marked my first taste of the product. Flat 12 is located just east of downtown on Dorman Street, and you really have to know where you’re going to find it. It’s across the street from the new Goose the Market Meatery enterprise, but otherwise, there’s not much going on in this industrial neighborhood ‘cept for a couple of really cool-looking modern condo buildings. We saw a glut of cars angling for street spots before we’d actually glimpsed the Flat 12 building, and figured we must be in the right neck of the woods. First impressions – the facility itself is really attractive, exposed brick walls, high beamed ceilings and good merchandising. Nicely done, y’all. You flash your ID when you walk through the door and get your hand stamped, then you’re given five free drink tickets for tastes of your choice. On to the important stuff. They really had a decently big selection available to taste during our visit, including eight or nine year-round classics and nearly half a dozen seasonal/specialty offerings. My favorite beer of the night was probably the Grain Wave American Wit, a straightforward wheat beer with a hint of citrus. A good all-around entry-level microbrew for a go-to domestic beer drinker like myself. 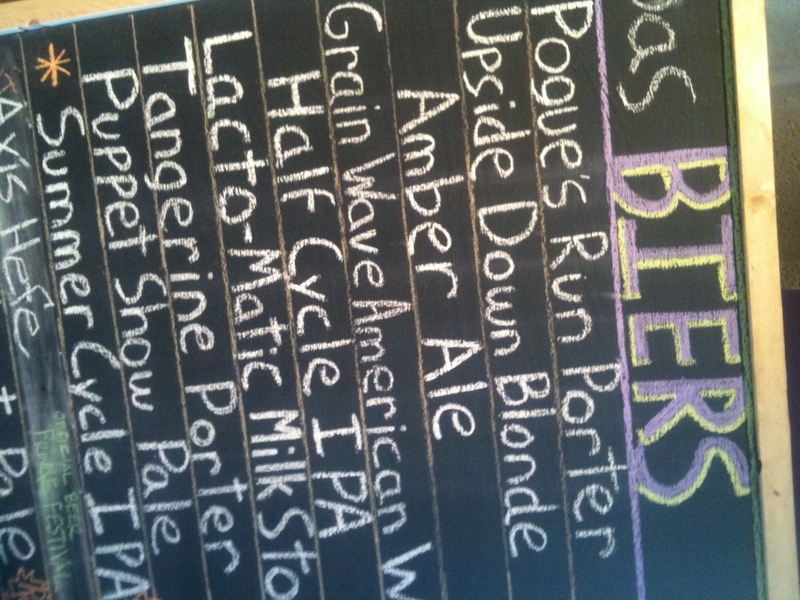 I liked the Upside Down Blonde too, but found the wit a little more flavorful. I managed to ask one of the busy servers what he’d consider the “signature” Flat 12 beer/s. He said the porter and the IPA. I usually find IPAs a little too hoppy for my taste, so I passed on the Half Cycle IPA and ordered a swig of the Pogue’s Run Porter, a dark but still mellow beer that I really liked. I was curious to try the Tangerine Porter as well to contrast and compare flavor notes, but alas, it had run out. Instead, I followed up with the Lacto-Matic Milk Stout. Wow, does this baby pack a punch. 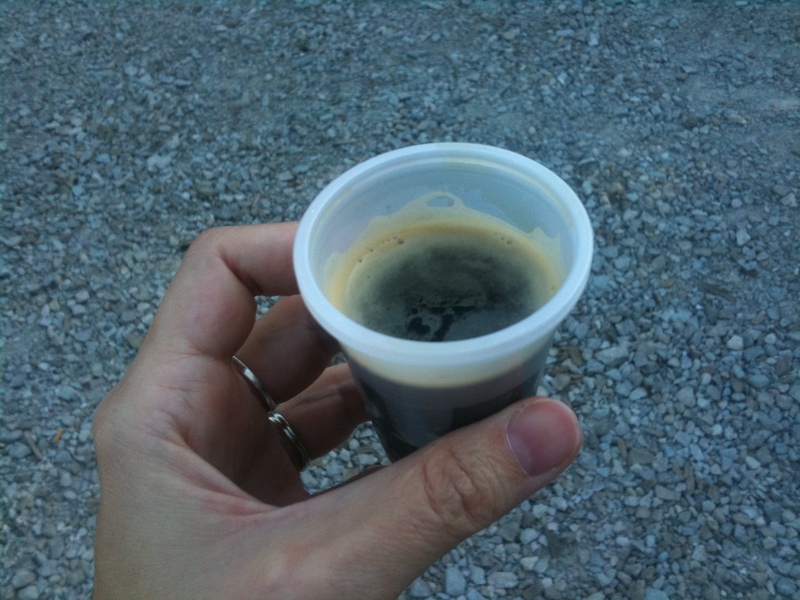 Imagine a beer-flavored shot of espresso and you’ve kinda got the right idea. It even looks like espresso in the cup. A little too much for me. I couldn’t finish it. 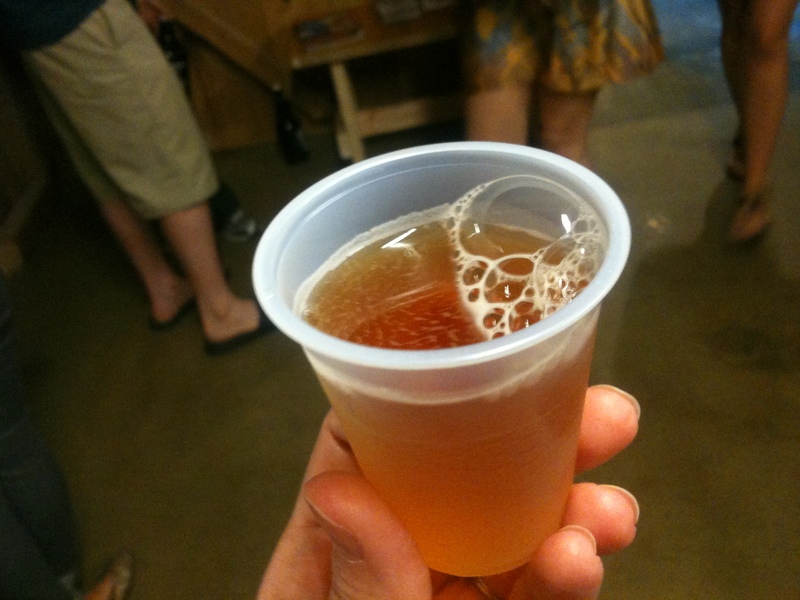 My tasting concluded with a sip of Walkabout Pale Ale, made with Galaxy hops from Australia. Didn’t like this one, the flavor was just a little too funky for me. The Flat 12 roster on the web site details several intriguing seasonal beers that I want to keep my eyes peeled for. Namely a German-style Karousel Kolsch (I learned to LOVE kolsch during our visits to Cologne within the past few years), the Bloody Blonde made with blood oranges and ruby red grapefruit (I enjoy fruity beers), and a Glazed Ham Porter (!) redolent with holiday spices. One small complaint about the tasting room service… the guys who were pouring seemed a little on the gruff side. This being our first time at Flat 12, I’d kinda hoped to ask a few questions about the beers and the business. The answers I got were short and borderline curt. I guess maybe “serious” might be a better word to describe the personalities here. I’m sure they’re probably perfectly lovable guys when you catch them outside a tasting rush. In any event, one gets the feeling they don’t mess around when it comes to their beer. Overall, we really enjoyed our Flat 12 visit. Good selling points— if you find a beer you really like while tasting, you can purchase a pint to enjoy on site (or a growler or half-growler to take home). And you can even grab some grub and make a meal of your visit thanks to the Byrne’s Grilled Pizza food truck parked outside in the side lot. We saw some of said pizzas flying around to the scattering of tables both indoors and out, and they looked and smelled damn tempting. Glad to finally make your acquaintance, Flat 12. I’m sure we’ll be seeing each other again. You can’t shake a stick these days without knocking over someone’s glass of locally brewed beer. The microbrewery scene has simply exploded all over Indianapolis in recent years, leaving plenty of grateful aficionados to enjoy the tasty fallout. If you appreciate local beer, you need to grab your empty growlers ($10 fills on Thursdays – woo hoo!) and get yourself down to Tomlinson Tap Room pronto. 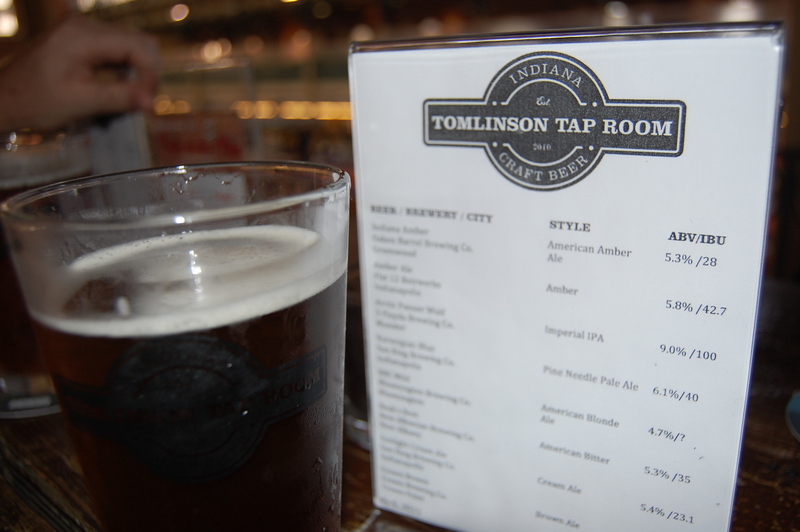 Located in downtown Indy’s historic City Market, Tomlinson Tap is, I believe, the only place in town that exclusively serves Indiana beers from a number of brewing establishments. And I’m not talking about just beers from here in Indianapolis (although there are certainly plenty to choose from in the Circle City). I mean from throughout the state. Don’t come in here thinking you can order any old bottle of Bud or Miller Lite. Tomlinson shows off 16 rotating taps of flavorful, full-bodied beers made fresh by Hoosiers for other Hoosiers. Nice. The décor is reason enough to visit. I’ve always loved City Market and sadly, don’t get down there very often now that I’m no longer working downtown. The market dates back to 1886 and the building is on the National Register of Historic Places. Inside the brick façade is a soaring marketplace filled with all sorts of distinctive food vendors and retail booths. 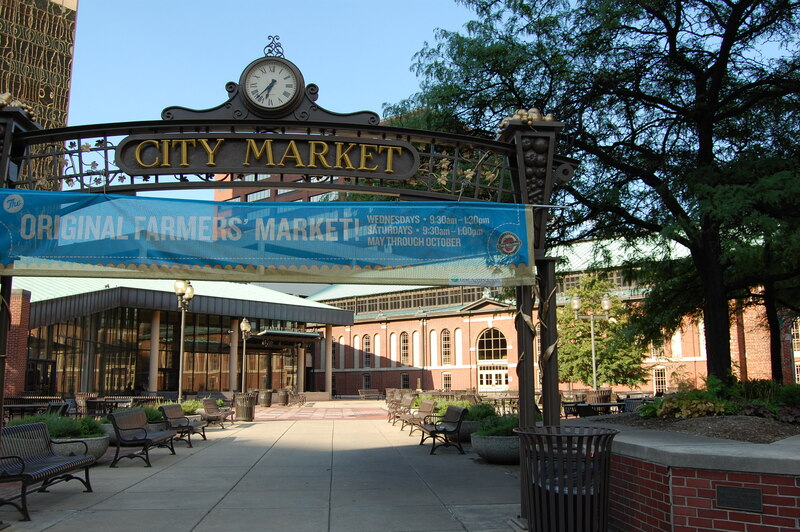 Add in the bustling weekly Wednesday farmers market that lines Market Street outside, and you’ve got all the makings of a darn cool downtown destination. 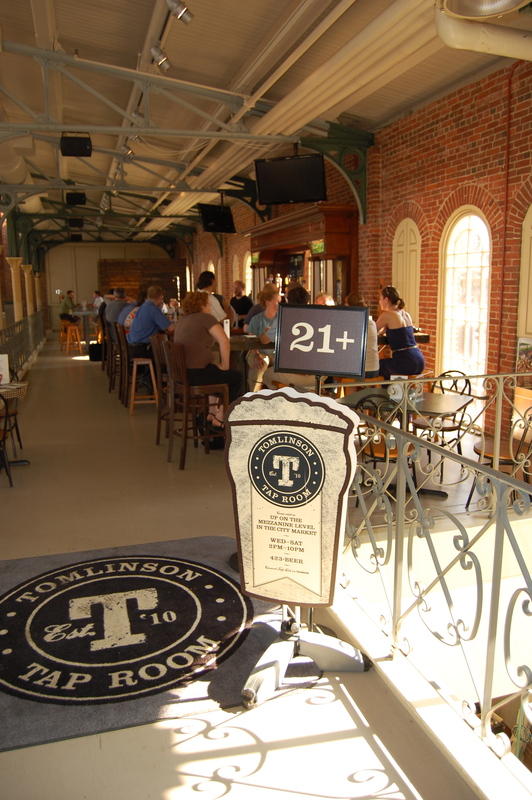 Tomlinson Tap Room nestles into a sunny southwest corner on the mezzanine level of the building, offering a bird’s eye view of the marketplace below. You may not even know it’s here unless you’re looking for it specifically, which makes it feel like you’re in on a well-kept secret. It’s not big, just a nice long bar and a scattering of tables. The hours have been a little limited, but I see on the Tap Room web site that they are now open Monday through Saturday. If you work downtown, this would make a fabulous happy hour stop. Tomlinson doesn’t serve food, but during the day of course, you have your pick of the City Market vendors for everything from ethnic food items to soups to pizza to sweet treats. 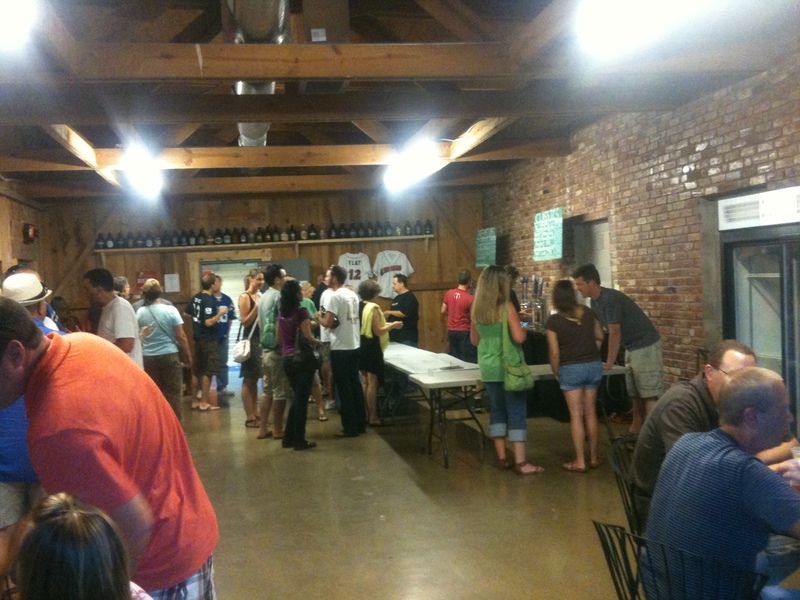 Several even stay open into the evening to satisfy the tap room patrons with various munchies. Hubby and I recently met a couple of new friends here for a beer, and it was a great, pub-style spot to hang out and relax. The servers and employees really know their stuff and if you ask nicely, may even let you taste a beer to see if you like it before committing to a full pint. You never know what you might find on tap any given week. During our visit, drinking options included offerings from Sun King, Flat 12, Three Floyds, Oaken Barrel, Crown, New Albanian and Big Woods (which we recently hit up in Nashville), to name a few. The bottom line? You won’t go thirsty here. Cheers.